Cone clutch, four speed sliding mesh gearbox, overhead worm rear axle (contemporary LGOC buses had 3 speed chain gearboxes – it would seem that, even way back then, AEC spur gearboxes were noisy and unacceptable to the Met). The first 4 tonner for London operation was reported in Commercial Motor in August 1923 as being destined for Messrs W.H. Collins and Co. trading as A1 and painted chocolate brown. The engine, described below, was supplied by the White and Poppe factory in Coventry, set up in 1899 by Alfred White and Peter Poppe (pronounced ‘Popper’ – he was a Norwegian). This company became the main supplier of engines to Dennis who went on to purchase the Coventry firm in the post war recession of 1919. This engine, stated in the 1923 report as being the power plant of the 4 ton bus, was a widely used and successful unit, 4591 examples being made up to the Dennis takeover in 1919, and it then continued in volume production until the late 1920s. This was certainly the standard engine of the 4 ton double decker. A modified version uprated to 70 bhp was fitted to Dennis’s first bespoke bus chassis, the E type of 1925. 120mm x 130mm = 5.881 litre, 40-50 bhp, but only 209 of this engine version were made before the Dennis takeover in 1919, and it does not appear in the Dennis list of engine drawings from that date, which indicates that it was not produced later. Unless the preserved vehicle has improbably received a very rare earlier type of White and Poppe engine, which is emphatically not the alleged Type D anyway, the 5.8 litre engine description must be considered doubtful. I believe the engine in D142 to be the standard 6.232 litre unit approved by the Metropolitan Police, but comments would be welcome. BK 2986 is a Thornycroft J, built in 1919 for Portsmouth Corporation. It originally had a Wadham O16/18RO seater body but was rebodied in 1926 with an ex London General AEC B 1920 Dodson O16/18RO body. 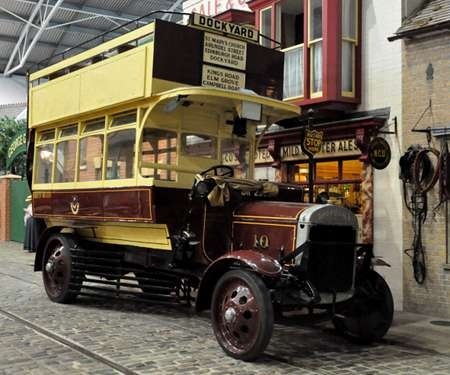 Having been built in Basingstoke, it is fitting that she is seen in the Milestones museum there, one of three Portsmouth buses. Note the tram tracks – there’s a Portsmouth tram there as well. The photograph was take on 12th November 2013. Thanks for posting this elderly bus in it’s current position. We are fortunate that Portsmouth Corporation had what we would now call an enlightened view of bus preservation. 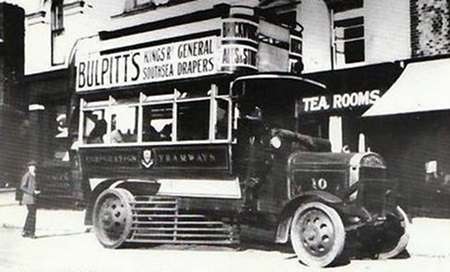 Both this bus, from it’s first ever batch of buses, and a tram (No 84) were retained by the Corporation from the 1930’s onwards. They also saved the very first trolleybus (201) in 1958, which then went to Beaulieu in 1960. It has had a more chequered history since, but has also resided at Basingstoke for a few years. It is now safe with the CPPTD (the preservation group, not the Corporation!) in Hampshire. The Thornycroft in the picture was quite often brought out and driven around on special occasions for some years. At that time it was in the then-current red/white livery. I remember seeing it at the Brighton Coach Rally c.1962, with a bikini-clad young lady hanging on at the back, trying to smile, wave, and keep her balance! In 1976 (I think), it was used by representatives of the Portsmouth Council to open the new M275 motorway into Portsmouth. Fortunately there was no park and ride service then, otherwise there might have been some suggestions for use? – no, probably not. Both this Thornycroft and the tram seem to be well cared for now, and located in a sympathetic setting at Basingstoke. Am I not right in thinking that this bus was originally No. 10, but renumbered 1 for most of its preserved life, more recently getting back its correct number? I used to see it a lot (with 201) at the late lamented Dave Chalker’s annual Southsea Spectacular on Southsea Common. Does anyone have a photo of one of these vehicles with original Wadham body. I had one but can’t find it now – typical! Another survivor is what’s left of the 1931 diesel-engined Crossley Condor (RV720), after being cut down as a service vehicle. After being abandoned on the council tip, it was rescued and is a runner. When you see vehicles like this, you realise the great strides made in chassis and body design in the 13 years between 1919 and 1932. Yes, Chris, this bus was originally No. 10 in the fleet, out of the series 1-10 for the batch. I read somewhere in a fleet history that it had also been used as a petrol tanker by the Corporation for a while after withdrawal from passenger service. 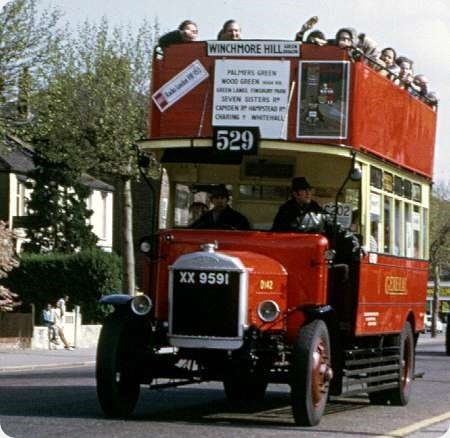 As the Karrier 6-wheel double-deckers bought in 1927/28 to replace these Thornycroft J’s were very thirsty buses , this probably explains the conversion. Another fleet history does state that the Karriers had to be refuelled during the day to keep them in service. Presumably, after the Karriers were withdrawn in 1935, No 10 was redundant as a tanker, and a Dodson body was re-united with it for preservation. It became No.1 in c.1942 – an odd year for such a decision to be made and carried out (don’t you know there’s a war on?). It remained as No.1 until virtually the end of CPPTD, and it’s correct original No.10 restored, I think in the early 1990’s, but I’m open to correction on that. I finally found the picture of No. 10 with its original body, on The Hard – I’ve only ever seen one other photo of these with Wadham bodies. I thought I’d lost this photo until I found it today tucked inside a book. My father was very friendly with Joe Mc.Cowen and I think he fought with his nephew(?) in the war (sadly he was killed in N Africa in 1941). Joe lived at 1 Bonny Street Camden Town NW1 and I used to go there with my father on a spurious excuse, which I suspect was just a ruse so some heavy drinking could be done. Joe’s place was in terrible condition and stank of old cigars. I think the bus was used on the 3 or 53 route, at least the bus terminus was very close to Bonny St. I remember my father telling me that Drake had run off with the conductress, so I don’t know what happened to the company after that! The picture looks like it might have been taken in Regent’s Park. I look forward to any comments regarding the above operator or vehicle. The definitive work on this subject is “London’s Buses Volume 1 – The Independent Era 1922-1934” by Messrs Blacker, Lunn, and Westgate, published by H J Publications in 1977 (and of course long out of print), from which the following information is extracted. According to the book, the business commenced in August 1923 and was originally a partnership of William Drake of 245 Great College Street N1 and Robert McCowen; but Mr McCowan left the business in about 1926 and Mr Drake continued as sole proprietor until he sold the business to Birch Brothers in October 1928. In addition a second-hand Leyland LB4 Dodson, XP 4355, was acquired for spares in 11/23. Its chassis was dismantled and the body used as a shed. XT 4603 achieved fame when it was overturned by protestors during the General Strike, but ran in service the next day with its windows boarded over. The original livery was creamy-yellow and black (or possibly very dark navy) with DRAKE & McCOWAN fleetname in large gold letters as per your photograph. After Mr McCowan left the fleetname was changed to DRAKE. In 1928 the livery was changed to red and white and the fleetname became W. R. Drake in script lettering. Drake and McCowan are known to have operated on route 27 (their version becoming 206 under the Bassom system in December 1924). Under the 1924 Act one of their buses operated on the 206 and the other on the 284A (unfortunately I have no idea where those routes went in those days). 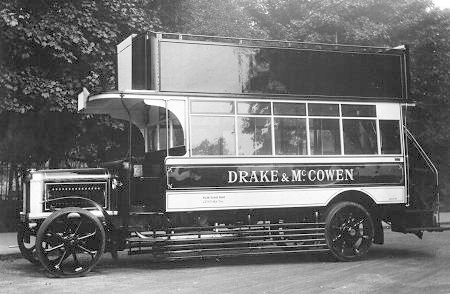 Drake & McCowan’s buses were originally kept, with those of several other independents, at Dangerfield’s garages in Camden Town and Chalk Farm, but when Dangerfield sold out to the LGOC in 1927 they were moved to Bridge Wharf Garage in Kentish Town Road. I know the shiny paintwork and stylish fleet name helps, but what a handsome, well-proportioned bus! There are good- and not so good-looking vehicles of all periods, but the team that designed this one can look down and be proud. Pauls photograph is a great reminder of the era of the London "Pirates". This Dodson body was the most popular fitment to Leyland LB series, and Dennis buses over the whole "Pirate" scene, followed by the Birch body, and, less common, Strachan and Brown. There is something uniquely distinctive about Dodson bodywork, as has been discussed before, but this is emphasised more when seen on some provincial fleets, notably Wolverhampton, and the style was quite popular in several fleets. Peterborough and District comes to mind, as well as Hastings Tramways. I wonder if this particular bus was one of the survivors into LT days, which were converted to trolleybus tower wagons. Thanks for a nice photograph. If memory serves me right, John W, LPTB stayed true to its AEC roots and used withdrawn NS buses as tower wagons, wire lubricators and, more generally, as tree loppers and mobile canteens. Surprisingly, at a time when many of the first-generation Green Line T’s were being replaced and available for conversion, it also bought some AEC Mercury lorries for use as tower wagons. I have no idea what vehicles LUT used for their ‘Diddler’ system which started in 1931, but maybe continued with the same ones they’d used to maintain the erstwhile tram system. It was all done on the cheap. I refer you to Capital Transport`s "The London Trolleybus Vol.2" re LB Leyland tower wagons. Full details are in there! The original ADC vehicles were used in LUT days.